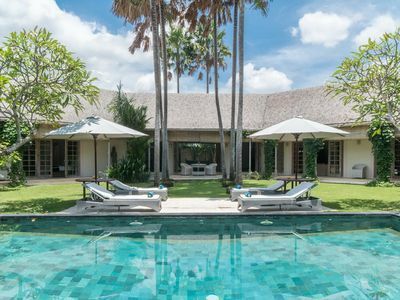 Exclusively designed for discerning visitors,the villa nestles discreetly among the lush paddy fields close to the legendary Echo Beach where the surf meets miles of soft sand. Just a short journey away from the rainforests beauty and magnificence of the islands volcanoes you will have unforgettable memories. 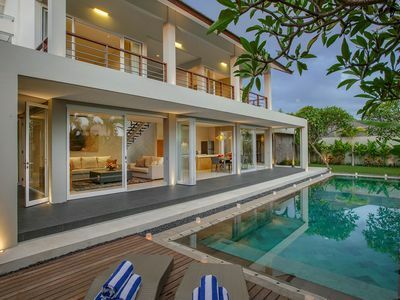 Located on the south-west coast of Bali and surrounded by rice fields, the Villa is located in the exclusive car-free development of Canti Asri, itself located in the charming village of Pererenan in Canggu. 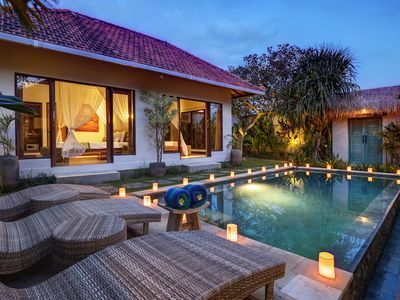 Set amongst stepped rice terraces and close to traditional Balinese temples, the Villa has a restful and peaceful ambience. 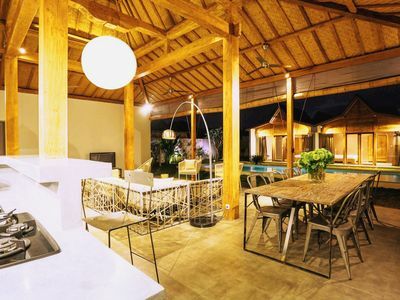 We offer our guests a relaxed and peaceful living environment that is within easy reach of all Bali has to offer. Leaving the main road to Tanah Lot, an ancient Balinese temple by the sea, and the world famous Nirwana Golf and Country Club, the drive into the village of Pererenan is stunning. Gently rolling valleys stepped with ancient rice paddies provide the perfect backdrop for those looking for picture postcards views of Bali. 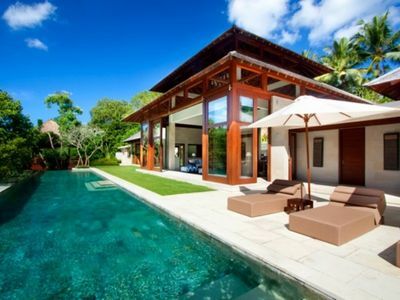 Set among this peaceful piece of paradise and less than 1 kilometer away from the beach, is this Villa. 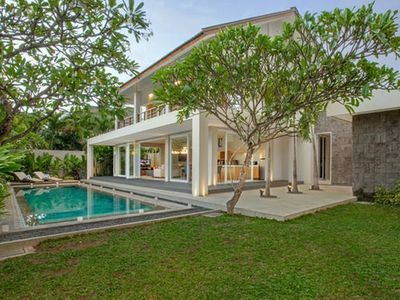 Situated in the exclusive car-free development of Canti Asri (Pererenan), the Villa is protected within its own private compound, and is accessed by a private entrance, leading into landscaped gardens. 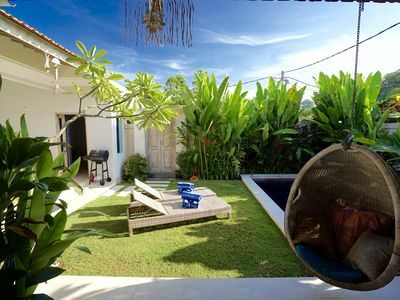 The villa is a fully staffed two bedroom villa with spacious accommodation for up to four adults. All bedrooms are air conditioned with patio doors to allow easy access and cool breezes. The cool and relaxing living area features a traditional hand built wooden roof with ceiling fans. The Dining table seats six comfortably. There are marble floors throughout complimenting the contemporary and stylish dcor. 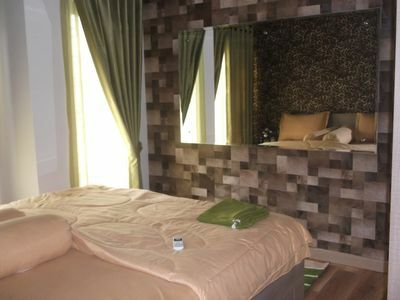 The stylish air-conditioned master bedroom has feature wooden floors, a large dressing area and a king sized bed overlooking the pool. The en-suite bathroom is luxuriously appointed with a white Zen bath tub, separate rain shower plus his and hers washbasins. 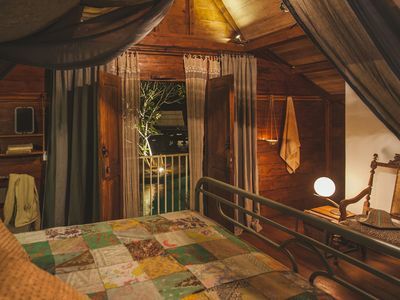 The second bedroom is located next to the covered terrace and is fully air-conditioned with wooden floors and a luxury king size bed. The en-suite bathroom has a separate shower with a rain showerhead and a large Zen bath tub. The kitchen is well-equipped with marble counter tops, a four-burner gas hob, electric oven, water dispenser, a large refrigerator/freezer, toaster, white chinaware, glasses, cutlery and a range of kitchen utensils. 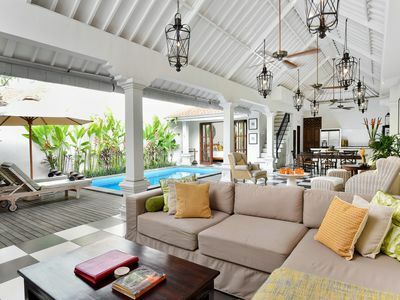 The covered open-air living terrace with comfortable rattan sofas and ottomans is well placed for relaxing by the pool. 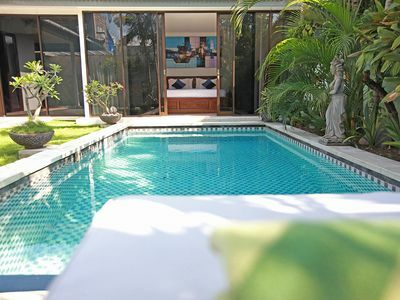 The private pool is accessible from all rooms surrounded by a lush and well maintained garden. 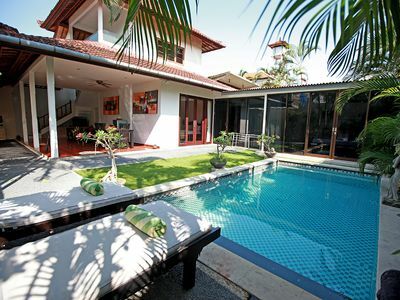 A wooden deck with a pair of sun loungers is ideal for sunbathing. The following services are included in your villa rate. There is a fully equipped kitchen and housekeeper available in the villa to serve and cook basic meals, drinks and snacks. Should you require the services of a Chef, this can be arranged with our Villa Manager at additional charge. Each day, the villa staff would be happy to go through the menu suggestions with you to assist you with making selections. Once you have selected your meals and provided the manager with a Rupiah advance, they will shop locally for supplies each day. To assist the villa staff with their preparation, they will ask for your menu 24 hours in advance. For those nights you opt to stay in, there is also a free delivery service from The Beach House Restaurant and La Sal Del Mar in Echo Beach offering everything from thin crust pizzas, pastas, burgers and fajitas to Indonesian favorites such as chicken satay and fried rice. We can arrange babysitters to villa guests at very reasonable rates. Our Villa Manager, Made can arrange spa treatments, manicures, pedicures and massages in the comfort of the villa at very reasonable rates. There is also a great little spa for manicures and pedicures in Echo Beach, 1 km away. 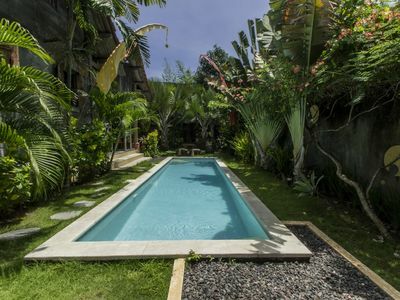 The Villa is set in the area of Canggu, a Balinese village with many surf beaches and rice paddy fields in every direction. Villa is a short drive away from Echo Beach with its world-class surfs, spectacular sunset views and charming beach side restaurants and shops. 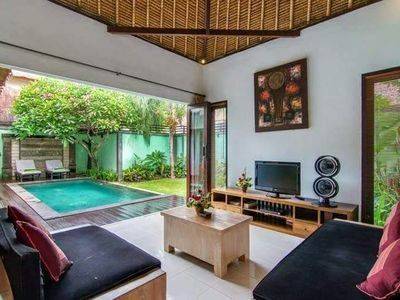 Whilst our location in Canggu is set amidst rice paddy fields, it is close to the trendy Seminyak and Legian area (only 15 minutes away) with a plethora of boutiques, spas and internationally known restaurants such as Kudeta, Warisan and our favorite, La Luciola. 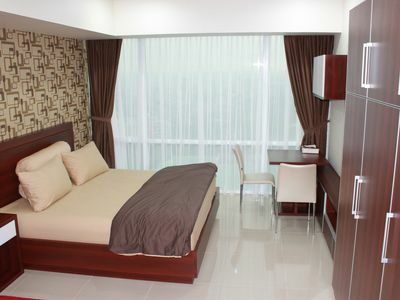 The famous Kuta beach is only 8 kilometers away. 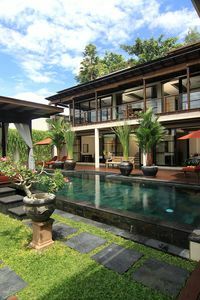 The Greg Norman designed; Nirwana Golf Course is a 20 minutes drive from Villa Senang as is the famous temple of Tanah Lot. 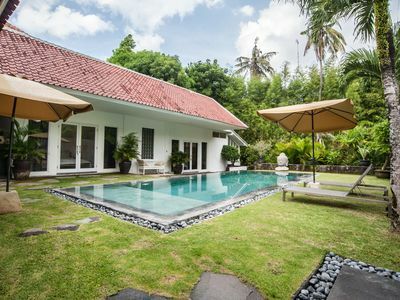 A daily membership can also be arranged (at additional charge) to the world class facilities at the Canggu Country Club, a 4000 sq m space set in the heart of Canggu in a beautiful colonial style setting with large lawns, tennis courts, gym, library and dining. 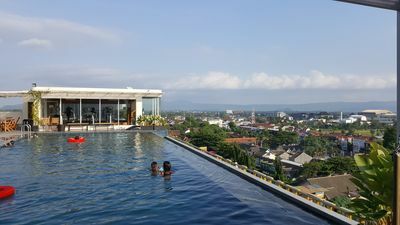 Canggu is approximately 45 minutes away from Ngurah Rai International Airport. 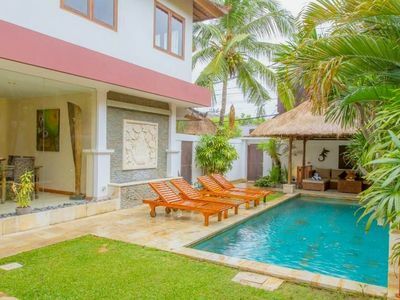 4 bedroom villa with pool in Seminyak!